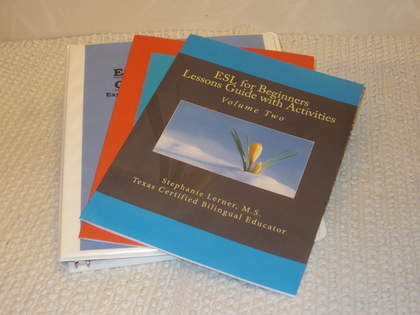 WELCOME TO THE BILINGUAL LEARNER PRODUCTS PAGE! Below are several products that can help kids or adults master a second language, adapt to American culture, manage their emotions, healthfully handle the effects of stress, solve problems through goal achievement, and more. These products are primarily planned for students ages 8-18 to be used by school staff such as teachers, counselors, assistant principals, teacher assistants, psychologists, etc. However, with a bit of adapting, the products below can also be used in a non-school setting (i.e.- clinical, residential, etc.) and/or with younger students and adults. Some of the recommendations pages that come with the guides have explanations for how to modify the products for different populations. If you don’t find what you are looking for or need assistance, please don’t hesitate to email us on the contact page. INTERMEDIATE LESSONS GUIDE WITH ACTIVITIES! A comprehensive, chronological set of 40 lessons with everything you need to teach your intermediate level students in the best practice methods of ESL/EFL instruction. 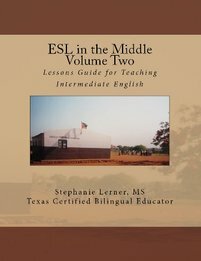 This guide focuses on speaking and listening skills and combines Volumes One and Two of ESL in the Middle for one low price! Just review this curriculum guide before your lesson each day, prep the materials it provides, and TEACH! Appropriate for ages 8-adult. 160 pages. 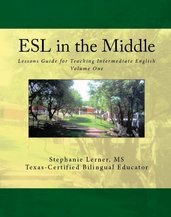 For a look inside The COMPLETE ESL in the MIDDLE Intermediate Lessons Guide, click here! PDF of all components above for just $14.95! The PDF includes all components listed above. It will be emailed to you once Paypal notifies us of your purchase. These 20 engaging activities will enrich any intermediate language lesson! They work great as the focal point of your ESL/EFL lesson, as practical applications, or even as a relaxing, 'break' from the traditional ESL/EFL lesson. With exciting activities such as Create Your Own Dialogue, Grammar Says, and Comic Strips, your students will be looking forward to English class each day! Appropriate for ages 8-adult. This guide is 20 pages. 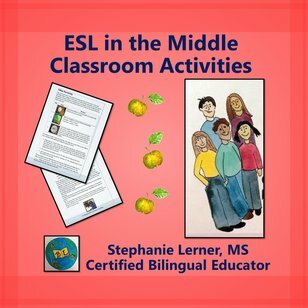 For a look inside ESL in the Middle Activities & Games, click here! PRICING: PDF VERSION for just 3.95! The PDF includes all components listed above. It will be emailed to you once Paypal notifies us of your purchase. This resource gives ESL/EFL teachers guidelines for how to teach grammar structures to their intermediate students. It also includes 17 easy-to-read structures for intermediate English learners such as contractions, modal verbs, possessives, present conditional, past continuous, and future perfect. Where applicable, each structure includes affirmative, negative, and question forms. This product also includes many sentence and question examples of each structure. It is 25 pages long. Appropriate for ages 8-adult. **These grammar structures are included in the ESL in the Middle Lessons Guides Vol. 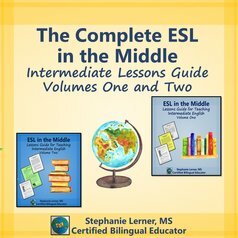 One and Two, as well as The Complete ESL in the Middle, so you do not need to buy these structures separately if you have already bought any of the ESL in the Middle Lessons Guides.***. 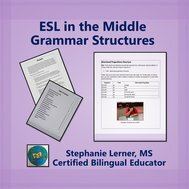 For a look inside ESL in the Middle Grammar Structures, click here! 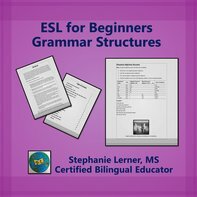 PDF of ESL for Beginners Grammar Structures for just $3.95! The PDF includes all components listed above. It will be emailed to you once Paypal notifies us of your purchase. THE COMPLETE ESL for BEGINNERS LESSONS GUIDE WITH ACTIVITIES! A comprehensive, chronological set of 60 lessons with everything you need to instruct your beginner level students in the best practice methods of ESL/EFL instruction. This guide focuses on speaking and listening skills and combines Volumes One, Two, and Three of our ESL for Beginners guides into one streamlined book! Just review this curriculum guide before your lesson each day, prep the materials it provides, and TEACH! Appropriate for ages 8-adult. 139 pages. For a look inside The COMPLETE ESL for Beginners Lessons Guide with Activities, click here! PRICING: BOOK VERSION for just $19.95! This is an individually administered test that places the student into 1 of 3 ESL levels based on their responses. This test also comes with a scoring key and guide. PDF of ESL Diagnostic Test with Scoring Key for just $4.95! It will be emailed to you once Paypal notifies us of your purchase. 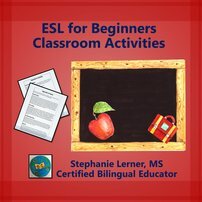 This guide is a chronological set of 20 ESL/EFL lesson plans to start you off in teaching your students beginning English. It focuses on speaking/listening skills and includes lots of engaging, stimulating activities on the beginning topics of present simple verb tenses, the to be verb, greetings, school and home vocabulary, pronouns, and more! Appropriate for ages 8-adult. 53 pages. For a look inside ESL for Beginners Lessons Guide with Activities Vol.1, click here! PRICING: BOOK VERSION for just $9.95! PRICING: EBOOK VERSION for just $6.95! The PDF includes all components listed above. It will be emailed to you once Paypal notifies us of your purchase. This simple, easy-to-follow, chronological set of twenty lesson plans will guide you to instruct your intermediate ESL/EFL students in speaking and listening skills. This guide builds on students' prior knowledge of beginning English concepts, while giving them a strong start into the intermediate English level with topics such as past and future continuous verbs, geography and space vocabulary, modal verbs, contractions, telling time, and more. It focuses on speaking and listening skills. Appropriate for ages 8-adult. 85 pages. For a look inside ESL in the Middle V1, click here! PRICING: EBOOK (PDF) VERSION for just $6.95! This simple, easy-to-follow, chronological set of 20 lessons has everything you need to instruct your intermediate ESL/EFL students on topics such as present perfect verbs, possessive pronouns, sports & food vocabulary, and more! Have fun teaching your students with dynamic activities, songs, and games! It focuses on speaking and listening skills. Appropriate for ages 8-adult. 94 pages. For a look inside ESL in the Middle Volume Two, click here! This comprehensive group guide will help students adapt to American life with weekly activities focusing on the cultural values, laws/rules, holidays, and traditions of America and American schools. **While the session activities are appropriate for any immigrant group, THE HANDOUTS ARE IN SPANISH.Appropriate for ages 8 to adult. 44 pages. Sessions Guide with 8 Sessions * Recommendations for Helping Students Transition to USA * Parent Permission Letter * Data Templates for Showing Student Progress * Holiday, Culture, and Lifestyle Activities * Group Rules, Evaluations * And More! 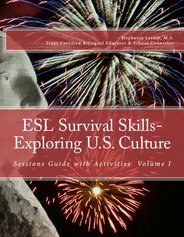 For a look inside ESL Survival Skills, click here! PRICING: BOOK VERSION for just $10.95! These 20 engaging activities will enrich any beginning language lesson! They work great as the focal point of your ESL/EFL lesson, as practical applications, or even as a relaxing break from the traditional lesson. With exciting activities such as Funky Phrases, Word Splash, and Guess It, your students will be looking forward to English class each day! Appropriate for ages 8-adult. This guide is 11 pages. For a look inside ESL for Beginners Activities & Games, click here! This structures ebooklet gives ESL/EFL teachers guidelines for how to teach grammar structures to their students. It also includes 19 different easy-to-read structures such as present simple, present continuous, the irregular verbs have/go/do, past tense, future tense, plurals, pronouns, commands, and more! Where applicable, each structure includes affirmative, negative, and question forms. This product also includes many sentence and question examples of each structure. It is 21 pages. For a look inside ESL for Beginners Grammar Structures, click here! 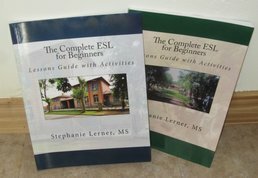 ESL for Beginners Volume Two is perfect for your "not-so-beginning" beginner ESL student! This simple, easy-to-follow, chronological set of lessons has everything you need to instruct your students on topics such as irregular verbs, the present continuous verb tense, plurals, transportation vocabulary, and more! It focuses on speaking/listening skills. Appropriate for ages 8-adult. 70 pages. For a look inside ESL for Beginners Lessons Guide with Activities Vol.2, click here! This simple, easy-to-follow, chronological set of 20 lessons has everything you need to instruct your students in best practice ESL/EFL speaking and listening skills! It will guide you to instruct your students on topics such as past tense verbs, articles, community & family vocabulary, numbers to 100, and more! Have fun teaching your students with dynamic activities, songs, and games! Appropriate for ages 8-adult. 74 pages. For a look inside ESL for Beginners Lessons Guide with Activities Vol.3, click here! Have you always wanted to learn basic English? Well, here is your chance with this simple, easy-to-follow, chronological set of 20 English activities with everything you need to master the basics of conversational English. Dive into lots of engaging, stimulating activities on the beginning topics of present simple verb tenses, the to be verb, greetings, school and home vocabulary, pronouns, and more! For a look inside Teach Yourself English, click here! **NOT YET AVAILABLE**PRICING: BOOK VERSION for just $12.95! PRICING: EBOOK (PDF) VERSION of all components above for just $5.95! The PDF includes all components listed above. It will be emailed to you once Paypal notifies us of your purchase. The guide will focus on the values, holidays, and traditions of various English-speaking countries and it is a perfect curriculum to support an English Club or to just to give your ESL/EFL students a fun cultural experience! Appropriate for ages 8 to adult. 34 pages. Recommendations Guide for Helping Students Understand the English-speaking Culture * Parent Permission Letter * Data Templates for Showing Student Progress * Holiday, Culture, and Lifestyle Activities * Templates for Session Note Keeping/Group Rules&Evaluations * And More! 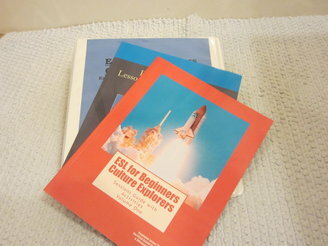 For a look inside ESL for Beginners: Culture Explorers, click here! This product includes a 5 page ebooklet that tells the history and traditions of Thanksgiving in both English and Spanish. The simple text has fill-in-the-blanks so that students can work interactively as they read the information. There is also room for students to illustrate each page of the booklet. Finally, this product comes with a bilingual Funquiz where students can test their knowledge of Thanksgiving after the instruction. This product is perfect for any ESL/EFL or bilingual classroom! PRICING: PDF of Thanksgiving in America for just $2.95! The PDF includes all components listed above. It will be emailed to you once Paypal notifies us of your purchase. 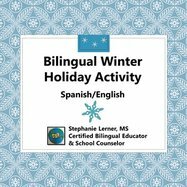 Celebrate and teach the diversity of American culture through this bilingual winter holiday activity. This product works perfectly as a cultural counseling group activity, as a reading comprehension activity for bilingual students, or even as a bilingual holiday guidance lesson! The resource includes an ebooklet that tells the history and background of five major holidays that Americans celebrate in the winter months. Using both English and Spanish, the booklet gives interesting facts on Christmas, Hanukkah, Ramadan, Kwanzaa, and Chinese New Year. The simple text has fill-in-the-blanks so that students can work interactively as they read the information. There is also room for students to illustrate each page of the booklet. Finally, this product comes with a bilingual Funquiz where students can test their knowledge of these five major winter holidays after the instruction. 14 pages. For a look inside the Bilingual Winter Holiday Activity, click here! PRICING: PDF VERSION for just $2.95! The PDF includes all components listed above. It will be emailed to you once Paypal notifies us of your purchase. This beginning ESL/EFL guide is a simple, easy-to- follow, chronological set of lessons organized in a succinct, weekly streamlined format for the teacher who already knows their way around a lesson plan. Strengthen your beginning students' listening and speaking skills with this guide! Lots of engaging, stimulating activities on the beginning topics of present simple verb tenses, the to be verb, greetings, school and home vocabulary, pronouns, and more! Appropriate for ages 8-adult. 40 pages. A Recommendations Guide for teaching ESL/EFL at the Beginning Level * 4 Weeklong Beginning English Units with Activities * A Diagnostic Test with Scoring Key/Guide * Vocabulary Activities & Grammar Structures * Games & Songs * Dialogues * And More! For a look inside ESL Express, click here! PRICING: PDF VERSION for just $5.95! The PDF includes all components above. It will be emailed to you once Paypal notifies us of your purchase. Once Paypal notifies us of your payment, we will send you an email with the product attached or head to the post office to mail out your book. No problem if you don't have a Paypal account- just click the "buy now" tab next to the product and you can use your credit card as a Paypal guest (quick and easy- no account required!) once it links you to the Paypal site. Please allow up to 1 week to receive the PDF of the product in an email. USA SHIPPING ORDERS ONLY, PLEASE- Allow up to 2 weeks to receive the book by regular domestic mail as all products are mailed using standard, domestic USPS shipping. If you need a book shipped outside the USA, please email us at bilinguallearner@hotmail.com before clicking the BUY NOW button. Get Your Group On: Multi-Topic Small Group Counseling Guides Volume One is now available at Youthlight Publishing! Get three of my best-selling group counseling guides in one book! Follow the link below to get a sneak peek or to order your copy now! Sessions Guide with 8 One Hour Sessions ENGLISH * Recommendations Guide for Stress Management Group ENGLISH * Parent Permission Letter ENGLISH/SPANISH * Stress and Anxiety Reduction Strategies ENGLISH/SPANISH * Informational Readings ENGLISH/SPANISH * Templates for Data, Group Passes, Session Notes ENGLISH * Achievement/Progress Activities ENGLISH/SPANISH * And More! PRICING: BOOK VERSION for just $13.95! PRICING: Bilingual EBOOK (PDF) VERSION for just $7.95! The PDF includes all components above. It will be emailed to you once Paypal notifies us of your purchase. This guide is currently being upgraded into an exciting book, Get Your Group On, Volume Two, that will be available in 2018! 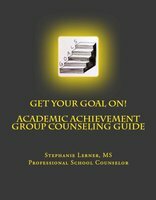 This guide will include 8 sessions of activities and info to guide your underachieving students to success! Lead your failing students to pass all their classes with organizational and study skill activities. Though minilessons, games, grade checks, and goal achievement, your students WILL start passing their classes! Appropriate for ages 8-18. 69 pages. Sessions Guide with 8 One Hour Sessions * Recommendations Guide for Academic Success Group * Parent Permission Letter * Organizational and Study Skills Strategies * Informational Readings * Games * Templates for Data, Group Passes, Session Notes * Achievement/Progress Activities * And More! For a look inside The Goal Getters, click here! **NOT YET AVAILABLE**PRICING: EBOOK (PDF) VERSION for just $6.95! *The PDF includes all components listed above. The PDF will be emailed to you upon purchase. This guide is currently being upgraded into an exciting book, Get Your Group On, Volume Two, that will be available in 2018!! This guide will include 8 sessions of stress-relieving activities and info to calm your anxious students/clients! Guide your most stressed customers to feel and function better in their lives through techniques such as breathing exercises, visual imagery, muscle relaxation, positive self-talk, and more! Appropriate for ages 8-18. 55 pages. Sessions Guide with 8 One Hour Sessions * Recommendations Guide for Facilitating Group * Parent Permission Letter * Stress and Anxiety Reduction Strategies * Informational Readings * Templates for Data, Group Passes, Session Notes * Achievement/Progress Activities * And More! 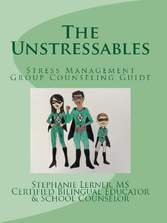 For a look inside The Unstressables, click here! This bilingual guide will include 8 sessions of activities and info to empower girls ages 8-18 to be confident, productive members of society. Through team building activities such as role plays, art projects, discussions, and journaling, this guide will keep your girls sharing and caring about topics such as making friends, body image, fostering healthy relationships, avoiding rumors, and handling "mean girls." This version of the guide also comes with Spanish translations of student session materials for use with bilingual or non-English speaking populations. Appropriate for ages 8-18. 77 pages. Sessions Guide with 8 One Hour Sessions ENGLISH * Recommendations Guide for Girl Empowerment Group ENGLISH * Parent Permission Letter ENGLISH/SPANISH * Strategies for Handling Friendship, Bullying & Mean Girl Issues ENGLISH/SPANISH * Informational Readings ENGLISH/SPANISH * Templates for Data, Group Passes, Session Notes ENGLISH * Achievement/Progress Activities ENGLISH/SPANISH * And More! For a look inside Charla Entre Chicas, click here! PRICING: Bilingual BOOK VERSION for just $13.95! This guide has been upgraded into an exciting book, Get Your Group On: Multi Topic Small Group Counseling Guides,Volume One, that is now available! Click on this Youthlight Publishing link to order it now! This guide will include 8 sessions of activities and info to empower girls ages 8-18 to be confident, productive members of society. This guide wil linclude topics such as friendship, the media, conflict resolution and avoiding rumors. Appropriate for ages 8-18. 54 pages. Sessions Guide with 8 One Hour Sessions * Recommendations Guide for Girl Empowerment Group * Parent Permission Letter * Strategies for Handling Conflict * Informational Readings * Templates for Data, Group Passes, Session Notes * Achievement/Progress Activities * And More! For a look inside Girl World, click here! **NOT YET AVAILABLE**PRICING: EBOOK (PDF) VERSION for just $6.95! The PDF includes all components above. It will be emailed to you once Paypal notifies us of your purchase. This guide gives you a clear plan on how to help your student/client through the grief process with 6 sessions of soothing, hopeful activities. Session topics such as choosing members of their support network, identifying characteristics of the grief process, closure through artistic expression, and envisioning a hopeful future are taught with gentle, soothing activities. This counseling guide is written for individual counseling but can be easily modified to use with groups, too. Appropriate for ages 8-18. 41 pages. Guide with 6 Weekly One Hour Sessions * Recommendations for Best Practice Grief Counseling * Parent Permission Letter * Inventories/Evaluations for Student Progress * Activities to Accompany a Grief-themed Picture Book (book recommended but not included ) * Data Templates * Additional Activities * And More! For a look inside Cope Into Hope Grief Counseling Guide with Activities, click here! This bilingual guide gives you a clear plan on how to help your student through the grief process and includes Spanish translations of all the session materials for use with bilingual or non-English speaking populations. This grief counseling guide is written for individual counseling but can be easily modified to use with groups, too. Appropriate for ages 8-18. 28 pgs. Guide with 5 Weekly One Hour Sessions ENGLISH * Recommendations for Best Practice Grief Counseling ENGLISH * Parent Permission Letter ENGLISH/SPANISH * Inventories/Evaluations for Student Progress ENGLISH/SPANISH* Activities to Accompany a Grief-themed Picture Book ENGLISH/SPANISH (book not included but a list of titles is included) * And More! 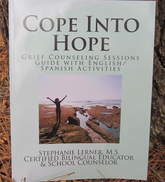 For a look inside Bilingual Cope Into Hope Grief Counseling Guide with Activities, click here! CURRENTLY UNAVAILABLE PRICING: Bilingual BOOK VERSION for just $10.95! NOW AVAILABLE! PRICING: Bilingual EBOOK (PDF) VERSION for just $5.95! The PDF includes all components above. It will be emailed to you once Paypal notifies us of your purchase. This eight session counseling guide uses role play and learning strategies to help student understand and manage their anger. Be Cool! has easy-to-follow sessions well suited for school, clinic, or residential environments. Appropriate for ages 8-18. 55 pages. Sessions Guide with 8 One Hour Sessions * Recommendations Guide for Facilitating an Anger Management Group * Parent Permission Letter * Anger Management Strategies * Informational Readings * Templates for Data, Group Passes, Session Notes * Achievement/Progress Activities * And More! For a look inside Be Cool Anger Management Counseling Guide, click here! PRICING: EBOOK (PDF) VERSION for just $6.95! The PDF includes all components above. It will be emailed to you once Paypal notifies us of your purchase. For a look inside ¡Tranquila!, click here! PRICING: EBOOK (PDF) VERSION for just $7.95! The PDF includes all components above. It will be emailed to you once Paypal notifies us of your purchase. This guide takes you step-by-step through the individual counseling process to help students effect positive, goal-based change in just 5 sessions! *You can also order Spanish translations of all the session materials for use with bilingual or non-English speaking populations. Appropriate for ages 8-18. 19 pages. Sessions Guide with 5 Weekly One Hour Sessions * Recommendations Guide for Facilitating Best Practice Individual Counseling * Parent Permission Letter * Various Rating Scales and Inventories to Elicit Student Info/Progress * Key questions for Each Step of Individual Counseling Process * Templates for Session Notes * And More! For a look inside Where There's a Goal There's a Way, click here! PDF of all components above for just $4.95! The PDF includes all components above. It will be emailed to you once Paypal notifies us of your purchase. This guide takes you step-by-step through the individual counseling process to help students effect positive, goal-based change in just 5 sessions! 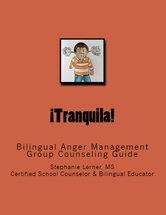 This version of the individual counseling guide also includes Spanish translations of all the session materials for use with bilingual or non-English speaking populations. Appropriate for ages 8-18. 28 pages. Sessions Guide with 5 Weekly One Hour Sessions ENGLISH * Recommendations Guide for Individual Counseling ENGLISH * Parent Permission Letter ENGLISH/SPANISH * Various Rating Scales and Inventories to Elicit Student Info/Progress ENGLISH/SPANISH * Key Questions for Individual Counseling Process ENGLISH * Templates for Session Notes ENGLISH * And More! For a look inside ¡Gol!..., click here! CURRENTLY UNAVAILABLE PRICING: BOOK VERSION for just $10.95! PRICING: EBOOK (PDF) VERSION for just $5.95! The PDF includes all components above. It will be emailed to you once Paypal notifies us of your purchase. This handbook will guide you to set up your comprehensive school counseling program according to the four components set by the American School Counselor Association- responsive services, guidance curriculum, individual planning, and system support. With detailed guidelines, templates, and reproducibles for each component, your school counseling program will be award-winning in no time! Sessions Logs * Recommendations Guides * Permission and Release Forms * Counseling Strategies * Informational Readings on Advocacy with Administrators * Templates for Data, Group Passes, Session Notes * Achievement/Progress Activities * And More! For a look inside The Complete Counselor's Handbook, click here! *NOT YET AVAILABLE* PRICING: BOOK VERSION for just $12.95!